The flower gardens decorating the landscape in front of the Legislative Building in the City of Regina, Saskatchewan are beautiful in the spring as the colorful flowers blossom. 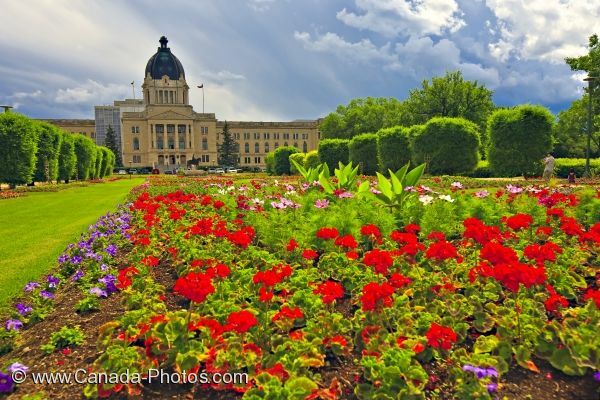 The gardens in front of the Legislative Building in the City of Regina, Saskatchewan come to life during the spring as the flowers blossom in an array of color. These gardens have been named the Queen Elizabeth II Gardens where people come on a daily basis to take pictures, walk, run, bike or to relax amongst the beautiful scents being emitted from the flowers. The gardens are laid out in a formal pattern as a statue of Queen Elizabeth II on horseback stands in the distance. The Legislative Building towering over the flower gardens, shows off its stunning architecture which dates back to its beginning in 1908. This landmark is one of the most important in the City of Regina and tourists should make time on their vacation to wander these gardens and tour the Legislative Building. Picture of the blossoming flower gardens on the grounds of the Legislative Building in the City of Regina, Saskatchewan. Queen Elizabeth II Gardens and the Legislative Building in the City of Regina, Saskatchewan, Canada.